From my hotel in downtown Montgomery, just a few blocks from the Alabama River, I never had to walk very far to discover another building that would quickly catch my eye. Not only are these structures attractive in their own right, but their histories are fascinating. In many cases, they played a pivotal role both in the formation of Alabama and the ongoing development of the United States. These are my favorites. Walking up wide Dexter Avenue, a main street lined with new government and office buildings, and old stores and churches, makes an impressive approach to one of the most architecturally understated but historically critical capitol buildings in the United States. Sitting atop Capitol Hill, the gleaming white Alabama State Capitol is always in view as you head up the avenue from historic Court Square. Completed in 1851 (with later additions), the Greek Revival beauty was declared a National Historic Landmark in 1960. Before Richmond, Virginia, was selected as the capital of the Confederate States of America, this building served as the first Confederate capitol. It was this building in which delegates from the Southern states voted to secede from the Union; Jefferson Davis was sworn in as the first, and only, president of the Confederate States of America; and the permanent Constitution of the Confederacy was adopted. A century later, the third Selma-to-Montgomery march terminated here in 1965. 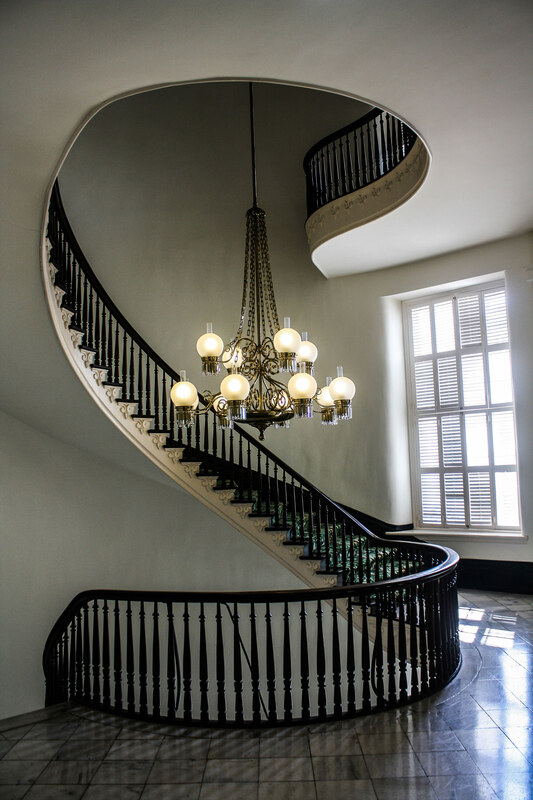 A marble staircase leads up to the columned portico, black and white clock, and smooth dome with windowed lantern. The interior is notable for its cantilevered spiral staircases and the murals painted on the dome interior that depict the state’s historic events, starting with the meeting between de Soto and Tuskaloosa in 1540. Outside, the grounds include the controversial Confederate Memorial Monument, honoring more than 122,000 Confederate veterans of the Civil War, and the decidedly less controversial Moon Tree, a loblolly pine grown from seeds that journeyed to the moon on the Apollo 14 mission in 1971. Now occupied by offices for a law firm, the Tyson-Maner House was constructed in 1888 for Civil War veteran and real estate businessman Archibald Pitt Tyson, whose daughter occupied the premises following her marriage to lawyer and member of the Alabama State House of Representatives Olin Connor Maner. Added to the National Register of Historic Places in 1979, this very handsome home was built in the Italian Villa style just as that architectural trend was beginning to wane. Located in one of Montgomery’s historic districts, the brick house boasts a number of notable features, including a wonderful central Tuscan tower, wraparound porch supported by semi-fluted Ionic columns, circle top windows, brackets at the roofline in between circular windows, and five slender chimneys. Stately, elegant, refined — a perfect Southern home. The only remarkable edifice around the Court Square traffic circle and its two-tier 1885 fountain — topped by a statue of Hebe, Greek goddess of youth, and whose water was dyed pink for a cancer-awareness fundraiser while I was visiting — the three-story Central Bank Building stands out among its bland neighbors. With its calm colors of brown and dark beige, the building was designed in the Renaissance Revival style. A row of identical medallions along the roofline are interspersed with single and double brackets, and arched windows with simplified tracery hint at a 16th-century Venetian palace. 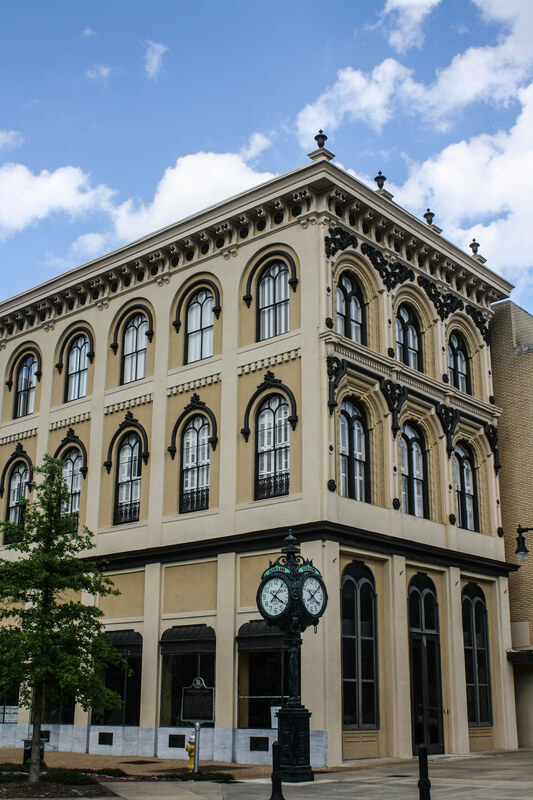 Built for the president of the Central Bank of Alabama in 1856, it was the first iron-front building in the state. The bank was the first to lend money to the Confederacy, but its generous support ended in financial ruin by the end of the Civil War. Occupied by other banks over the next few decades, it finally found 60 years of stability when Klein & Son Jewelers purchased it and operated in the building from 1923 to 1983. The company’s free-standing, 3,800-pound, four-faced clock, from 1938, still functions and remains a favorite meeting place for residents and visitors alike. The Arts Council of Alabama took over the building in 1985 and was replaced later on, in 2005, by the Foundation for Moral Law. Just steps away, a historical marker indicates the bus stop where Rosa Parks said “no” in 1955. 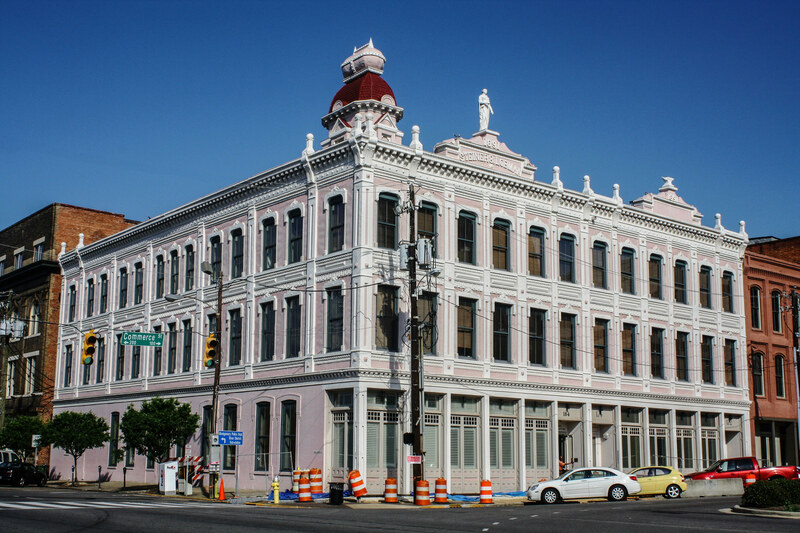 The metal casket, the eight-foot goddess, and the anvil atop the three-story Steiner-Lobman and Teague Hardware Buildings immediately grabbed my attention as I approached this pink-and-white corner property in the Lower Commerce Street Historic District. 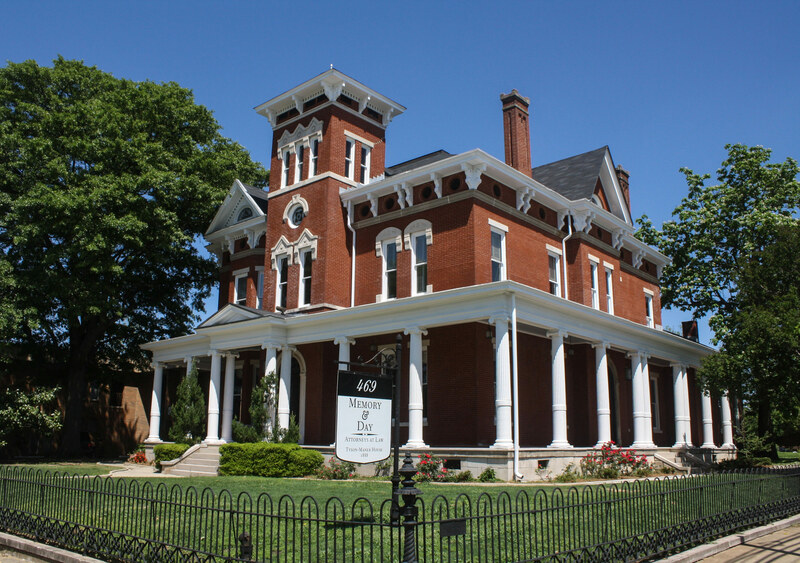 Added to the National Register of Historic Places in 1979, the masonry Victorian-Italianate buildings have barely changed since they were originally constructed in 1891 by wholesalers Louis Steiner and Nathan Lobman. Completed during a boom that accompanied the city’s expansion as a wholesaler to its surrounding counties, Steiner and Lobman wanted to ensure that their highly decorative commercial building impressed both their customers and the general public. They succeeded. Its rich ornamentation includes rope molding, egg and dart, rosettes, sturdy brackets, finials, and raised panels. Two stories of single-window bays divided by pilasters along one side of the building give way to a symmetrical 1-2-2-3-2-2-1 pattern on the other side. Although the anvil sculpture seemed fitting to a hardware store, the purpose of the goddess remained a mystery. And as far as the casket, atop a 15-foot corner tower with a curved mansard roof, is concerned, it’s widely believed that it was simply a bit of whimsy to hide the blandness of a functional cistern. I, however, preferred the long-standing urban myth that a resident added the casket because he wanted to be buried in a spot where he could look out over his beautiful city of Montgomery forever. 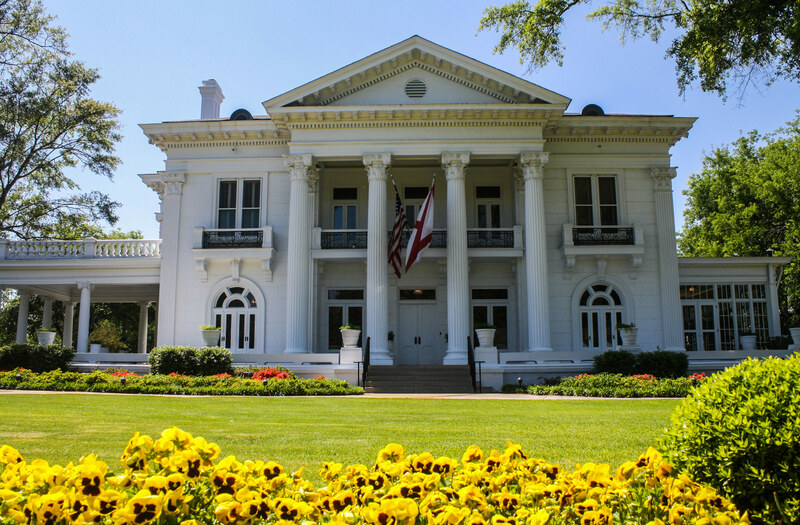 Although the Governor’s Mansion was built in 1907, it didn’t become the home of the state’s leader until 1950, when Alabama purchased it for $100,000 and then spent more than that to renovate and furnish it. Originally, the white Neoclassical mansion was constructed for Colonel Robert Fulwood Ligon, Jr., lawyer, clerk of the state supreme court, and son of a Confederate veteran. He died in 1939, and it was his widow who sold it to the state. Two-story fluted columns topped by Corinthian capitals support a large entablature at the front of the building. Ornamental balustrades adorn the second story. To the left, a porte-cochère supports an outdoor space above it; to the right, a glass-enclosed sunroom affords occupants pleasant views of the lovely grounds. Fronted by a well-trimmed lawn abutting a white brick wall with iron railings that separates the property from the sidewalk along South Perry Street — all low enough so that the casual passerby can easily admire the home and grounds — the mansion could not be a classier, more becoming residence for one of Alabama’s highest-ranking officials. I loved the architecture of each building. The Governor’s mansion was my favourite among all. It has such a beautiful landscape. Thanks! They’re certainly attractive, aren’t they?